StarCraft: Remastered is a remastered edition of the 1998 real-time strategy video game StarCraft and its expansion Brood War, which was released on August 14, 2017. It retains the gameplay of the original game, but features ultra-high-definition graphics, re-recorded audio, and Blizzard's modern online feature suite. The remaster was developed over a year and included playtesting from professional StarCraft players. StarCraft: Remastered retains the gameplay of the original, but updates its graphics and sound. Its remastered graphics support up to 4K ultra-high-definition resolution, and its original soundtrack and sound effects are re-recorded. Its online features are updated to support Blizzard's modern suite, including improved multiplayer matchmaking, social integration with other Blizzard games, and saved settings on Blizzard's cloud computers such that player campaign progress, replays, custom maps, and keybindings are synced wherever the player opens the game. Players can pair their online accounts from the original game with Blizzard's modern online accounts to continue their win/loss statistics into the remaster. Additionally, players can switch between the original and new graphics and view new zoomed perspectives for players to appreciate the remaster's new level of detail. It was localized into 13 languages. Blizzard developed the remaster over a year. The game's original artist returned to assist with development. Professional StarCraft players including Flash, Bisu, and Jaedong gave the company feedback during several playtests in South Korea. Blizzard's president publicly announced the remaster in late March 2017 at a StarCraft event in Seoul, Korea. It was also announced that later that week, Blizzard would make the original games—the StarCraft Anthology—free to download and would include an update with some of the remaster's features including the ability to run on modern computers. The remaster was released on macOS and Windows on August 14, 2017. The developer has said that their classic games team plans to further support the community after the remaster's launch, and will look for feedback on ideas such as voice chat integration. Players who purchased the title in advance of its release received alternative aesthetic options for in-game assets in both the remaster and StarCraft II. Blizzard's Robert Bridenbecker and Pete Stilwell explained to Team Liquid that in almost every respect that Brood War fans care about, StarCraft: Remastered will be the same as Brood War, as it's the same client powering each version. An essay by "Thieving Magpie" of Team Liquid explained the difference between the [original and remastered], stating that the StarCraft engine generated such classic gameplay because of its awkward compromises between a flat 2D engine and the forced isometric perspective it presents to the player. In Patrick Wyatt’s own words: "Because the project was always two months from launch it was inconceivable that there was enough time to re-engineer the terrain engine to make pathfinding easier, so the pathfinding code just had to be made to work. To handle all the tricky edge-cases, the pathing code exploded into a gigantic state machine which encoded all sorts of specialized 'get me out of here' hacks." StarCraft: Remastered had a pre-release of the game in South Korea, where the game was available to play two weeks early in the country's PC bangs. 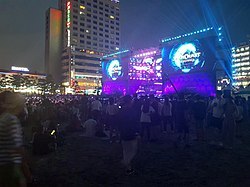 Blizzard also hosted a pre-release launch event at Gwangalli Beach in Busan which was attended live by thousands of spectators and viewed online by over 500,000 viewers. At this celebration, the StarCraft: Remaster Pack was on sale. And the event was played by Guillaume Patry, Hong Jin Ho, Lee Yoon Yeol, Park Jung-suk, and Lee Jae Dong and Kim Taek Yong, and Lee Young Ho. Following the game's release, Blizzard announced plans for continued development, including improved matchmaking and support for the game's competitive scene. On June 15, 2018 they announced the launch of the Korea StarCraft League (KSL), a competitive league to run alongside the AfreecaTV StarCraft League (ASL) run by afreecaTV with two seasons planned for that year. The league began airing regular matches starting on July 19, 2018. In February 2019, it was confirmed that the league would continue running beyond its initially announced two-season run for 2018, with 2019's first season set to begin in April. On June 19, 2018 Blizzard announced that a new ranking system would be implemented as part of patch 1.22. This system ranked players from the F to S, the latter representing the top 1% of players. To accompany the new rankings, profiles were updated to include select statistics for players and have borders of their profile portraits corresponding to their ranking. Additional cosmetic rewards for ranked play were unique profile pictures for all players ranked B, A, or S. The update also featured general improvements to matchmaking, an updated map pool. Following resumed updates for the original StarCraft and its expansion, Brood War, gaming and tech outlets praised Blizzard's commitment to its older games. The announcement of the original game becoming free and a remaster being in development was also met with speculation of potential other remasters coming from Blizzard. 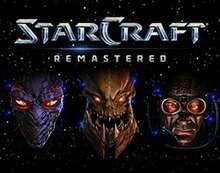 StarCraft: Remastered received favorable reviews upon release, with critics praising its visual improvements and commitment to the original's gameplay. On Metacritic, it currently has an average score of 85 out of 100 based on 30 critics, indicating "generally favorable reviews". PCGamer's Tyler Wilde commended the game's successful modernization and stated that, despite minor grievances, "This is a project for StarCraft fans that serves them whether they spend $15 or not, and makes no compromises." In a positive review, IGN's TJ Hafer praised the game's faithfulness to the original and concluded, "StarCraft Remastered makes the original game play as well as you remember and look as good as you remember." Some reviewers took issue with the unchanged gameplay of StarCraft: Remastered and expressed concern that it would not be friendly to new players. In an overall positive review, Softpedia's Silviu Stahie wondered if the decision to leave the gameplay of the original untouched would hurt the title's appeal and stated, "[...] the new generation might not appreciate it." Similar worries were shared by M3's Viktor Eriksson, who felt that the remaster was unnecessary, with no changes to the gameplay and too few changes overall. ^ a b Te, Zorine (March 26, 2017). "StarCraft: Remastered announced, releasing this summer". Yahoo Esports. Retrieved April 18, 2017. ^ a b c d McWhertor, Michael (March 26, 2017). "StarCraft: Remastered coming this summer". Polygon. Retrieved April 18, 2017. ^ a b c d Te, Zorine (March 26, 2017). "Blizzard's StarCraft: Remastered took one year to make, post-launch support confirmed". Yahoo Esports. Retrieved April 18, 2017. ^ McWhertor, Michael (March 26, 2017). "Blizzard is making the original StarCraft free". Polygon. Retrieved April 18, 2017. ^ McWhertor, Michael (June 30, 2017). "StarCraft: Remastered coming Aug. 14". Polygon. Retrieved June 30, 2017. ^ "GG Together – StarCraft: Remastered Korea Launch Event". July 28, 2017. Retrieved August 1, 2017. ^ "'Starcraft: Remastered' prelaunches in Korea". July 31, 2017. Retrieved August 1, 2017. ^ "블리자드, '스타크래프트: 리마스터' 부산 광안리 런칭 행사 공개". 중앙일보 (in Korean). July 3, 2017. Retrieved March 30, 2018. ^ "스타크래프트: 리마스터". starcraft.com (in Korean). Retrieved March 30, 2018. ^ "Blizzard Launching Its First StarCraft: Remastered League". IGN. Retrieved August 2, 2018. ^ "New StarCraft: Remastered ladder system is live!". Retrieved August 2, 2018. ^ a b "Starcraft Remastered". Metacritic. Retrieved April 23, 2018. ^ a b "StarCraft Remastered review". IGN. Retrieved April 23, 2018. Kuchera, Ben (August 18, 2017). "The trouble with Zerglings: How Blizzard updated a classic (while keeping it the same)". Polygon. Retrieved August 20, 2017.